When times are tough and the anxiety for the future comes crawling in and doesn’t let you sleep or breathe, there is only one, or maybe two things you can do. Cook and Write. New column for Love Your Larder dear reader, I hope you’ll enjoy it! 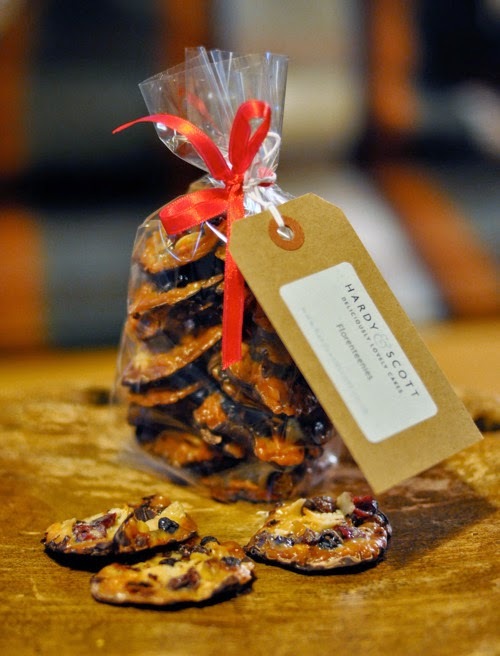 Photos of the delicious florentines are by Lucy. Ever wondered what an ‘artisan producer’ is like? Nafsika meets the founders of Hardy & Scott and debates if real food can ever be shop bought? Chef Antoine Carême once wrote: “When there is no more good cooking in the world, there will be no more keen and elevated intelligence, no more pleasing relationships, no more social unity”. It is a cold yet very sunny Monday morning as we set off to Walthamstow to visit Lucy from Hardy & Scott. 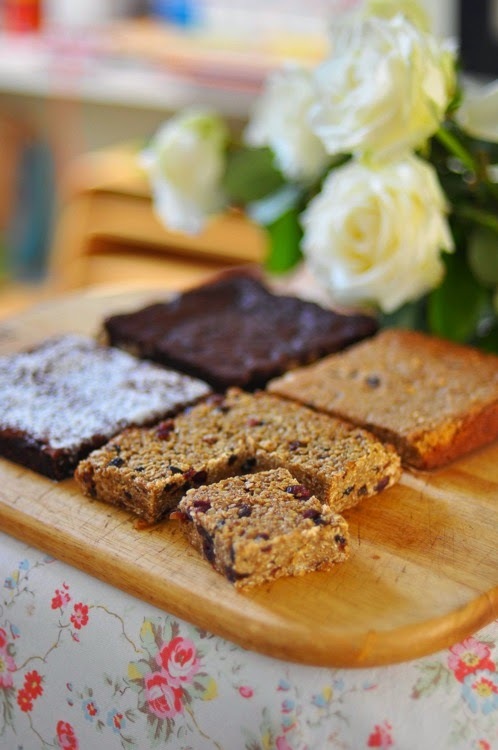 Having heard a lot about their cakes and tray bakes we wanted to see how home baking can become a sustainable business and how it links to our quest for real food. Over a cup of tea and (what else?) a selection of her delicious creations, we talked about her work (although she pointed out that, for her, baking is not work) and the importance of home cooked food. You see Lucy is not only a talented baker but also an excellent cook that appreciates the importance of quality ingredients and the pleasure of preparing dinner every night. Lucy Scott, and her friend Sarah Hardy, created Hardy & Scott three years ago. Sarah is preparing the cakes and all the other beautifully decorated sweets and Lucy is preparing a wide selection of tray bakes, such as the mocha-chocolate brownie we tasted. The company has grown slowly, but steadily, mostly through word of mouth, and they have since been sending their creations throughout the UK. So, do Londoners enjoy baking? And who buys these tray bakes, we asked, wondering if the two can go together. Many of the orders Lucy receives are of course for presents or corporate gifts (here at Love Your Larder we know very well the beauty of receiving a box full of delicious foodstuffs! ), but many home bakers also choose to order from Hardy & Scott on special occasions such as parties and events. Clearly, Lucy’s fruity flapjacks are preferred to the industrial ones. Could this be a sign that this type of home cooked food is rising? Tasting what can be probably characterised as the most interesting Florentine ever, we learned that Lucy sources her ingredients from various places, ensuring that they are always fresh and of excellent quality. 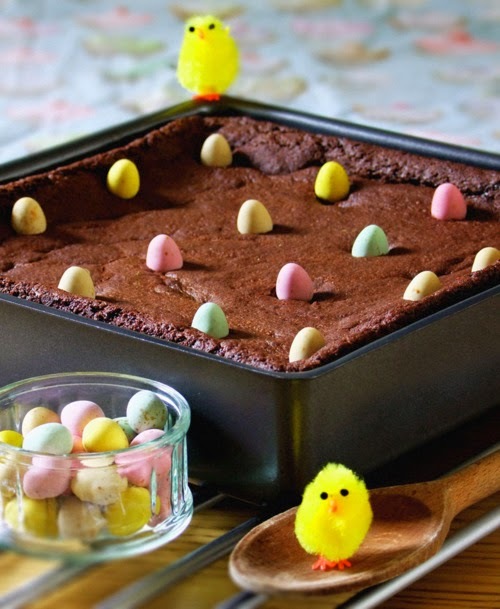 She explained how she will make several trips to various supermarkets and wholesalers to find the specific free range eggs she needs for her brownies, while she discussed the price fluctuations of cocoa over the past two years. Eating yet another Florentine (and debating internally if asking for the recipe could pass as part of the interview), we asked Lucy for her definition of real food. Home cooking, she replied. Not only does her house almost always smells like cake (the joys of her profession) but she tries to cook something new every day and would rather have a simple bowl of pasta with olive oil and parmesan cheese than microwave a ready-made meal. Of course, with the progress of technology the concept of home cooking has changed. Throughout the 20th century there has been an evolution in peoples cooking habits. The rapid growth of supermarkets along with technological advances led to the rise of frozen, canned, dehydrated and pre-cooked convenience foods that were soon mass marketed, no longer being considered luxury foodstuffs. On the contrary, they were often cheaper than fresh ingredients. This, together with the new kitchen technologies decreased the time spent in the kitchen, so much so that today one needs only to turn on the oven to “create” a posh three course meal. Indeed, one can now prepare a simple tomato-basil pasta sauce using either fresh tomatoes bought at a farmer’s market, pre-cut tinned tomatoes bought from the supermarket or even a ready-made pasta sauce in a glass jar that just needs warming up. All these different levels of cooking preparation can be included within the broader context of home cooking, making its definition a challenging task and a complex process. Is food less “real” if one chooses pre-cut vegetables, skipping the step of peeling and chopping? Or does cooking lose its significance and health attributes because we use frozen or canned corn instead of fresh? And what about convenience foods which you may customize by adding your own herbs and spices or even some extra vegetables? Does the notion of real food disappear just because you did not prepare the food yourself from scratch? Let us also consider different countries and different cultures. In Egypt for example street food plays a very important role in the urban diet. Workers have breakfast and lunch outside the house and traditional foods are consumed at local cafes, which play a very important role in Egyptian social life. So when searching for real food one needs to keep an open mind. Home cooked food, through its many forms and manifestations is certainly a key element of real food. It is up to us to define them. We ended our lovely meeting discussing Lucy’s plans for the future. Smiling, she said that although she would like their company to grow, she would never want it to lose its character and the home cooked feeling of her creations. We couldn’t agree more! We left, still tasting the sweet Florentines and regretting not taking her up on her offer for a box of them. We walked out to sunny London, happily thinking that our quest for real food really brings us closer to people who love their larder and always prepare their food with love and care.